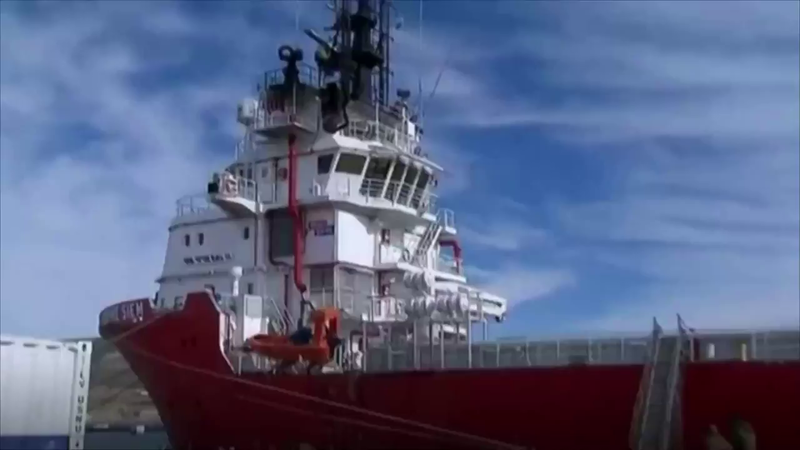 Argentina’s official weather service ordered an alert for “intense winds of between (31 and 56 mph), with gusts,” in Chubut province, the location from which search vessels were sailing. “The bad weather conditions really are adverse,” navy spokesman Enrique Balbi told a news conference. 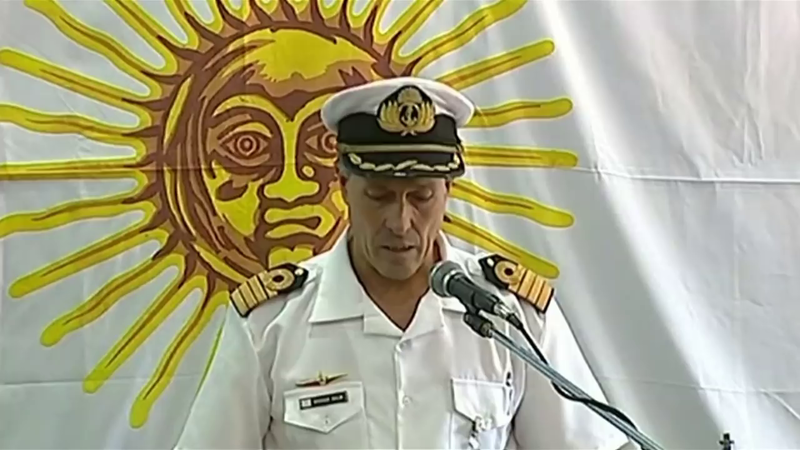 The ARA San Juan (pictured) has been missing for a week after reporting a fault before dropping out of communications. “We’ve been searching for 11 days but that does not remove the chance that they could still be in an extreme survival situation,” Balbi said. The U.S. Navy’s Undersea Rescue Command sent a ship from Chubut’s port Comodoro Rivadavia on Sunday, outfitted with a remotely operated mini-sub to be used as a rescue vehicle if the San Juan is found. 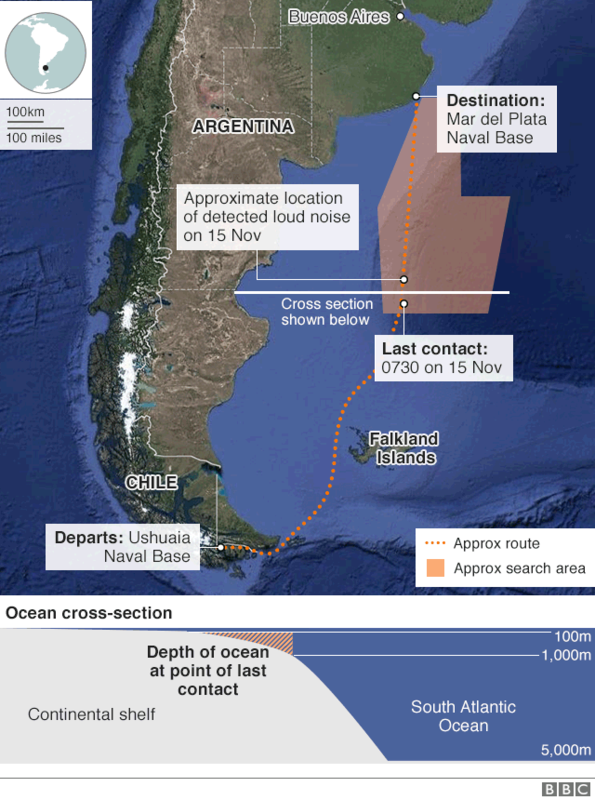 The ship was expected to reach the search zone some 430 kilometers (267 miles) off Argentina’s southern coast by Monday afternoon. A sudden, violent sound detected underwater near the last known position of the 213 feet long diesel-electric submarine suggested it might have imploded on the morning of Nov. 15th, after reporting an electrical problem and being ordered back to base. “Hope always high,” said the burly Vallejos, his posture ramrod straight and eyes hidden behind sunglasses. A black baseball-style cap identified him as a navy war veteran. 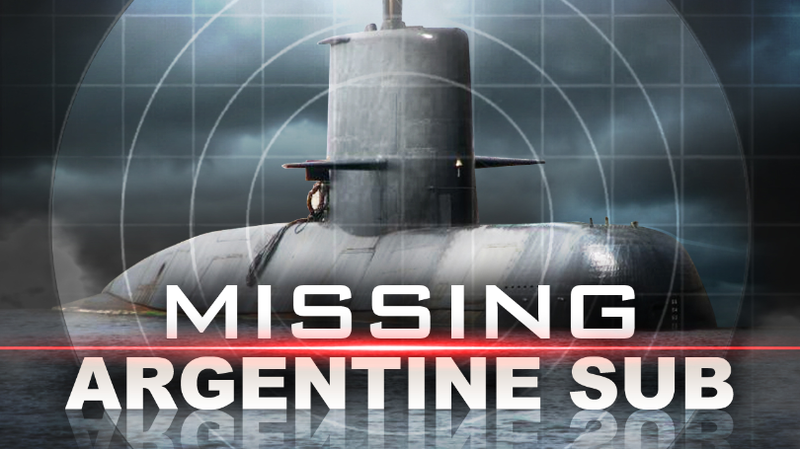 “We are in a state of total uncertainty,” Maria Victoria Morales, mother of Luis Garcia, an electrical technician aboard the missing Cold War-era submarine, told Reuters by telephone. The 66-meter (216.5 foot) sub—which was built in Germany in 1983—is carrying a crew of 44 submariners. 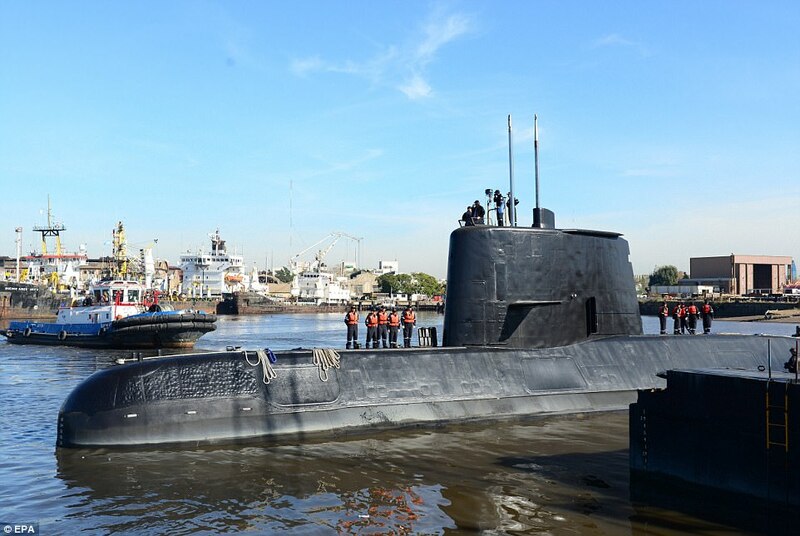 Forty-three of the crew members are male, but the sub is also carrying Eliana Maria Krawczyk, the first female submarine officer in Argentina. b) What hope do some relatives have that the crew of the ARA San Juan is still alive? c) How many countries have sent planes and ships to search for the missing sub? d) What type of assistance has the U.S. sent? Why can’t subs be detected? Submarines are built to be difficult to find. Their role is often to participate in secret surveillance operations. So how can subs be found? There are a number of ways that the captain or crew can make their location known if in distress. These methods include sending signal calls to contacts at naval bases or allied ships, or releasing a device that floats to the surface but remains attached to the submarine. Before the submarine went missing, the crew had reported a malfunction in the vessel’s batteries caused by an intake of water through the snorkel system (by which it renews oxygen). However, the commander reported that the problem had been resolved. On Wednesday, Nov. 22 (one week after the sub disappeared), the navy said there had been a loud noise detected about 30 nautical miles (60km) north of the last-known location of the submarine. A spokesman called this a “hydro-acoustic anomaly.” On Thursday, the same spokesman – Capt Enrique Balbi – said there was an event consistent with an explosion nearby but the cause was not known. He called it an “abnormal, singular, short, violent, non-nuclear event” and said the search would continue in the same area. What if it has sunk? “If it had sunk in waters of less than about 180m (600ft) it’s likely that someone would have tried to escape from the submarine,” speculates Mr Little. “As that hasn’t happened, it’s probably in waters deeper than that. 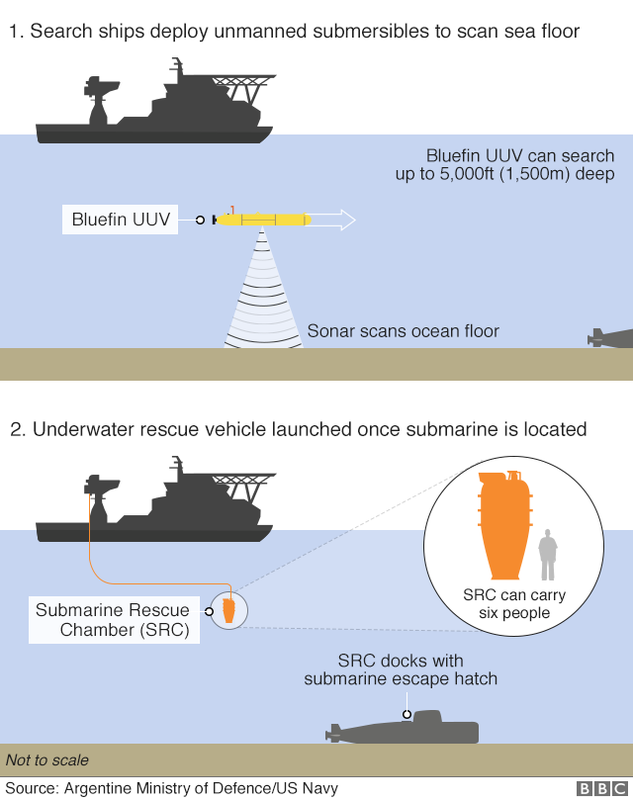 Rescuers can’t reach below 600m, Mr Little said – and below that, each submarine has a “crush depth” at which point its structure will not be able to withstand the water pressure. It is extremely rare for submarines to sink, Mr. Little points out. It last happened in 2000, when the Russian submarine the Kursk sank in the Barents Sea, killing all 118 crew on board. How long can a crew survive submerged? The number of days that a crew can survive depends on how long they have already been performing duties underwater and how well prepared they are for losing power. How is the crew trained for this? One of the most important practices is for trapped crew members to slow down their breathing rates in order to conserve oxygen. The conditions, likely to be cold and damp, may well have a detrimental impact on morale, but the personnel on board will be well trained and disciplined. They will likely establish routines, making themselves as comfortable as possible while minimizing their movements and supporting one another as they await rescue. The response to these emergency incidents has also been improved at the international level since the Kursk disaster. An organization called the International Submarine Escape and Rescue Liaison Office, based near London, co-ordinates all international response and is playing “a key role in this operation,” Mr Little says. With a possible shortage of oxygen and a build-up of carbon monoxide, suffocation is the number one risk. Oxygen can be supplied either through canisters or generators that perform a process called “electrolysis” – which effectively separates components such as water and oxygen. However a lack of power will hinder this process and the supply may gradually run out. There are other dangers that could also come into play. Dr. Farley points out that if a compartment within a trapped sub becomes flooded, this can lead to “flash fires and other nastiness” as the air gets further compressed. Is there a plan for such accidents? In the event that a submerged vessel suffers problems in returning to the surface, procedures can be implemented to help raise it. To control buoyancy, the fuel or ballast tanks – which can add weight – can be emptied and used to lift the sub. To achieve this, the diesel fuel or ballast is released, emptying the tanks, and the chambers are then filled with air.